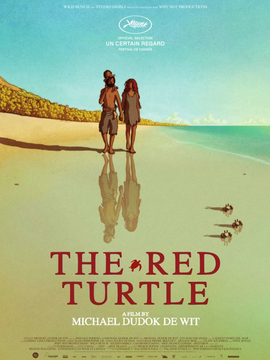 The Red Turtle (French: La Tortue rouge) is a 2016 French-Belgian-Japanese animated film directed by Dutch-British animator Michaël Dudok de Wit in his feature film debut. The film is a co-production between Wild Bunch and Studio Ghibli, and tells the story of a man who tries to escape from a deserted island and battles a giant turtle. The film has no dialogue.It premiered in the Un Certain Regard section at the 2016 Cannes Film Festival where it won the special prize. Released in France, the film is likely to release in other countries too shortly. There aren’t many kids’ movies that could be described as a “mood piece,” but this is one. The gentle lull of the water lapping all around is evocative of others in the oceanic canon – Moana, Finding Dory – but it’s much lower-key. The Red Turtle is in simple watercolor style 2D animation. Even the storm that wrecks our Robinson Crusoe’s ship is like something from a dream wrought at the end of a paintbrush.